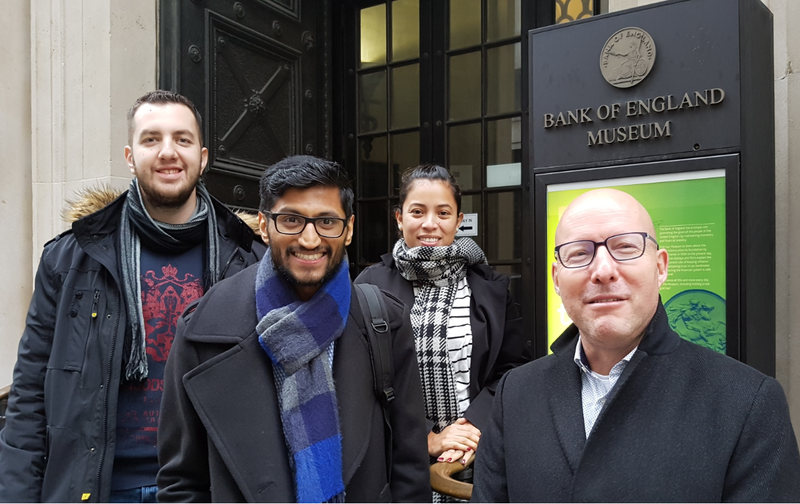 Our MSc International Banking Finance and Risk Management students ventured to the Bank of England Museum on Tuesday 5th December. The museum explains the history of the Bank of England and its work today at the heart of the UK economy. The museum has a number of interactive stations where visitors can try to navigate the economy through stormy weathers and to keep the inflation at bay. (We failed bitterly in both tasks.) There are also a number of short films on show which explain recent pertinent events in which the ‘Old Lady of Threadneedle Street‘ was involved, such as Black Monday and the recent financial crisis. The highlight of the visit was the test whether visitors would be able to lift a gold bar with one hand. The bar weighs roughly 13 kg and the value on Tuesday was £379,000, so it is a real challenge for everyone.